My company's goal is to take the stress out of having a sale of a loved ones belongings. Our goal is to make it as stress-free as possible for the family .We take care of everything from beginning to end. We also treat their loved ones memories and belonings with dignity. We strive to do the best possible sale for our clients. Antiques, Collectibles and More !! Estate Sale In The Villages, FL. 3 Bedroom Home with Pool in Hernando, FL. A Peaceful Way Sale in The Villages, FL. Southern Lifestyles Designer Home in The Villages, FL. World Traveling Sibling's Sale In The Villages, FL. Pop Up 1 Day Boutique Estate Sale In The Villages, FL. World Traveler in The Villages, FL.
" Tools, Photography, Kitchen Gadgets and More !! " This sale is on a very BUSY street, so PLEASE watch as you open your car doors and walk to the sale house !! This is a sale that has a lot of items for the Guys, some items for the Ladies ! Estate Sale By Holly in Clermont,FL. We have Collections upon Collections ! 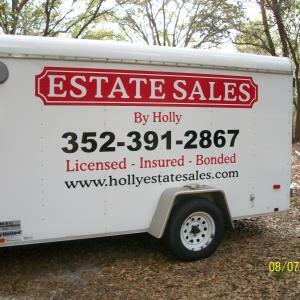 Estate Sale By Holly In The Villages, FL. Super Clean Home on the North Side of The Villages, FL. House of Fabulous Furnishings in The Villages, FL. Sweet 3 Bedroom Villa in The Villages, FL. An Eclectic Home in Howey-In-The-Hills, FL. A Happy Home in The Villages, FL. A 3 Bedroom Home in Mount Dora, FL. 2 Bedroom Home in The Villages, FL. 3 Bedroom Home in Ocala,FL. A Villa in The Villages, FL. It's a Collections & Collectibles kind of Home in The Villages, FL. Lovely Villa in The Villages, FL. 1 Day only Moving Sale in The Villages, FL. A Little Bit of Everything in The Villages, FL. 3 Bedroom Home in The Villages, FL. 2 Bedroom Villa in The Villages, FL. Premiere 3 Bedroom Home of World Traveler's in The Villages, FL. 2 Bedroom/Den home in The Villages, FL. It's a Dollhouse in The Villages, FL. 3 Bedroom Villa in The Villages, FL. This is a 3 bedroom home in The Villages, FL. This company has posted a total of 124 estate sales. Only the most recent 50 sales are shown.